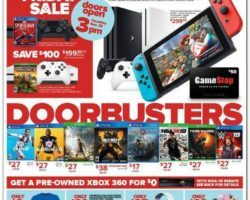 GameStop Black Friday Sales 2019. 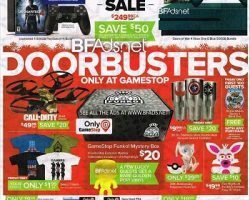 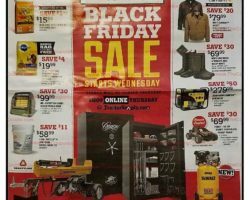 Find GameStop Black Friday Ads and video games doorbuster deals for 2019 from blacknfriday.com. 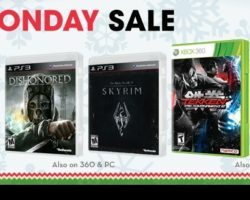 Selling one of the best selections of new and pre-owned video games, PC games, consoles, collectibles and virtual reality gear, GameStop has established itself as a trusted retailer in the country, nowadays operating an online shopping hub in addition to more than 6,455 locations worldwide. 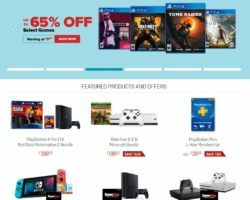 The GameStop Company was established in 1984 in Dallas, Texas and it currently operates under different banners. 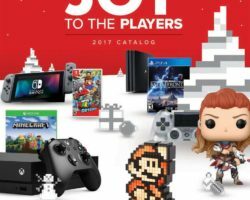 Aside from the retailer banner, the business owns EB Games, Micromania, Impulse, ThinkGeek and Zing Pop Culture among other divisions. 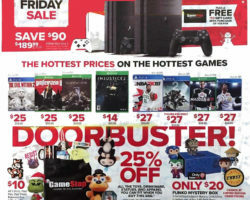 Last year the GameStop Black Friday Sale carried a number of popular deals such as Buy 2/ Get 1 Free on any pre-owned items of equal or lesser value. 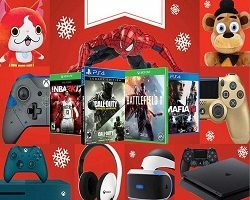 Door busters such as the $99.99 ACTIVEON CX HD Action Camera with a free 16 GB MicroSD Card included and the $199.99 Astro A40 TR Headset + MixAmp Pro TR ranked among most popular picks.